The histopathology/ISH core facility offers a variety of histological techniques, immunohistochemistry, in situ hybridisation, laser capture microdissection, as well as automatic slide digitisation and analysis to CRUK CI scientists. The core provides routine histological processing of tissue sections as well as immunohistochemistry and in situ hybridisation. Histological services include the capability to process animal tissues and cell lines into frozen, paraffin or resin formats. In addition to the standard hematoxylin and eosin (H&E) staining, the Facility can perform any special stains, such as Masson’s Trichrome, Periodic-Acid-Schiff, Reticulin and Oil Red O. The Facility constructs microarrays for the Institute and external collaborators. The Facility has two Vision Biosystems BondMax II autostainers, one BondMax III stainer for performing fully automated immunohistochemistry (IHC) and a Bond Rx research instrument, representing the first of these systems in Europe. These 30-slide systems are highly standardised and will complete an IHC run, including deparaffinisation and antigen retrieval, within 2–4 hours. We routinely run 2,000 slides per month through these systems, which demonstrates the robustness of the system. The Facility has 340 antibodies working to date, and has also worked up tyramine amplification for weak staining and TUNEL for apoptosis. Figure 1. 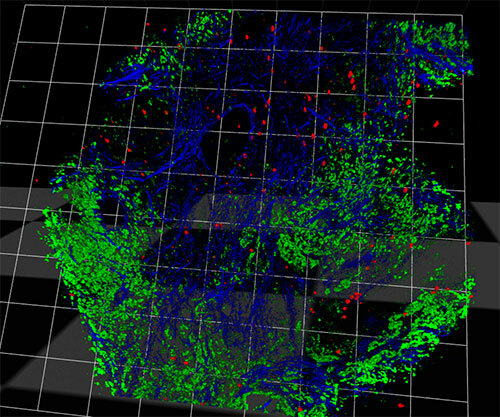 A three-dimensional reconstruction of a 300 µm vibratome section of pancreatic tumour which has been cultured with a population of immune cells (red), demonstrating the localisation of those cells to the tumour (green) and the surrounding connective tissue (blue). The Facility has been beta-testing branched DNA technology from Affymetrix to replace radioactive in situ hybridisation using 35S-labelled riboprobes and has now launched this for use. This technology, performed automatically on the Leica Bond Rx, will produce up to 30 ISH slides overnight, thus increasing the facility’s throughput and capacity. Laser Capture Microdissection is also offered through the ISH Facility using the Zeiss PALM Microbeam. We have worked up fluorescence ISH (FISH) for the Y chromosome, HER-2 CISH and miRNA ISH. A standalone microscope capable of brightfield, fluorescence and darkfield imaging with basic image capture software. For high throughput fully automated image capture of tissue sections and tissue microarrays up to 60x in brightfield or fluorescence. For fast automated brightfield scanning at 20x, or 40x, resolution at 2.5 minutes/slide. The systems are connected to two separate data storage spaces, 10TB for Aperio and 30TB for Ariol, with the Ariol having an additional four processor farm for high-throughput batch analysis. Current analyses being used include nuclear proliferation with Ki-67 or BrdU, cell surface analysis of HER2, cytoplasmic analysis of CK5/6, tissue based analysis using Aperio Genie, and fluorescence intensity. Finally, the Facility has installed a web-based viewing platform from PathXL for external viewing and scoring of digitised slides.